"Renewable" means that the fuel source isn't some form of fossil fuel. The source could be algae, a plant such as jatropha, or even rendered animal fat. In late March and early April 2011, a team at NASA's Dryden Flight Research Center in California tested renewable biofuel made from chicken and beef tallow in one of the four engines of a DC-8 airplane. The airplane remained on the ground during the test, known as the Alternative Aviation Fuels Experiment, or AAFEX, while aeronautics researchers measured the fuel's performance in the engines and examined the engine exhaust for chemicals and contamination that could contribute to air pollution. It was the first test ever to measure biofuel emissions for nitrogen oxides, commonly known as NOx, and tiny particles of soot or unburned hydrocarbon - both of which can degrade air quality in communities with airports. NOx contributes to smog and particulate matter contributes to respiratory and cardiovascular ailments. "The test results seem to support the idea that biofuels for jet engines are indeed cleaner-burning, and release fewer pollutants into the air. That benefits us all," said Ruben Del Rosario of NASA's Glenn Research Center in Ohio. Del Rosario manages NASA's Subsonic Fixed Wing Project, which sponsored the experiment through the agency's Fundamental Aeronautics Program. The team ran one engine using Hydrotreated Renewable Jet Fuel, or HRJ, and another engine using Jet Propellant 8, or JP-8, fuel, which is very similar to the industry standard Jet-A fuel used in commercial aircraft. They also ran one engine using a 50-50 blend of the two fuels. The experiment's chief scientist, Bruce Anderson of NASA's Langley Research Center in Virginia, said that in the engine that burned the biofuel, black carbon emissions were 90 percent less at idle and almost 60 percent less at takeoff thrust. Anderson added that the biofuel also produced much lower sulfate, organic aerosol, and hazardous emissions than the standard jet fuel. Researchers will spend the next several months comparing the results and drawing conclusions. "NASA Dryden was excited to contribute to the study of alternative fuels for aviation use," said Frank Cutler, NASA's DC-8 flying laboratory project manager. "The results of these tests will tell us a lot about emissions generated by modern turbine aircraft engines using these fuels," Cutler said. The test setup involved positioning the DC-8 at Dryden's Aircraft Operations Facility in Palmdale, Calif., surrounded by ground support equipment, emissions sensors, and test equipment trailers to house the researchers and observers. 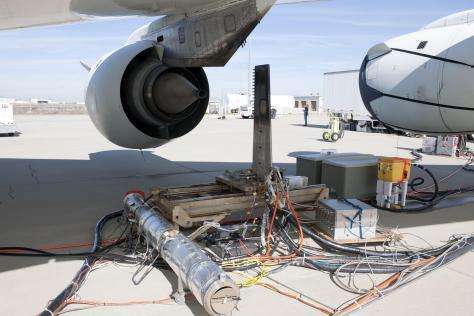 The AAFEX tests in 2009 and this year were funded through NASA's Aeronautics Research Mission Directorate in Washington. Is chicken fat biofuel an eco-friendly jet fuel alternative?